My friend, if you are a professed “atheist,” I promise you that YOU WILL BELIEVE IN GOD after the very first 5 seconds of awakening in the horrifying flames of Hell beneath in the earth. There are no atheists in Hell. One of the most celebrated, quoted and infamous atheists was comedian George Carlin, whom I liked; yet, he is sadly a believer in God this moment in the fires of Hell, as he awaits his final judgment at The Great White Throne Of Judgment (Revelation 20:11-15). The Bible teaches and warns in Revelation 20:11-15 that God the Father will bring up all the dead from Hell (Greek: Hades) and the dead, and He will judge the dead, casting them into the Lake of Fire (Greek: Gehenna) for all eternity without hope or end. 2nd Thessalonians 1:8 warns that God Himself will punish them, taking vengeance upon them with flames of fire. 2nd Thessalonians 1:8, “In flaming fire taking vengeance on them that know not God, and that obey not the gospel of our Lord Jesus Christ.” Only a total fool would dare say that these plain Scriptures are merely figurative, or mean anything other than exactly what they teach. I don't write this article to be unkind; but rather, to WARN YOU OF THE JUDGMENT TO COME IN THE LAKE OF FIRE! Colossians 1:28-29, “Whom we preach, warning every man, and teaching every man in all wisdom; that we may present every man perfect in Christ Jesus: Whereunto I also labour, striving according to his working, which worketh in me mightily.” Only one sin can keep a person out of Heaven, which is the unpardonable sin of unbelief. If you die in your sins without having received Jesus Christ as your personal Savior in your lifetime, you will go to Hell to burn forever. 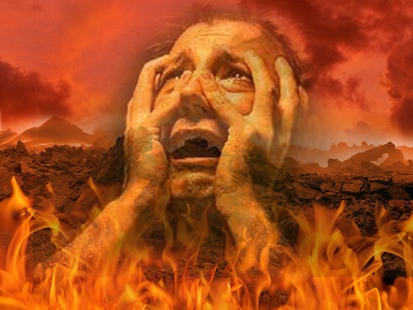 Nobody Is Laughing In Hell (a life-changing, red-hot, MP3 sermon by Evangelist Phil Kidd). Everyone who goes to Hell pays their own way, but every one that goes to Heaven has a free pass. But you say, “I don't believe in Hell!” You are not alone, a USA TODAY poll shows 59% of Americans don't believe in a literal Hell. ARE YOU GOING TO HELL? (video). Whether or not you believe that a literal Hell exists doesn't change the fact that it DOES exist. Are you calling God a liar? God authored the holy Bible. The Bible teaches much more about Hell than it does Heaven. Research the Scriptures and you'll find an incredible amount of information on Hell. If you'd like to read an excellent Biblical study about Hell, I recommend “A BIBLICAL EXAMINATION OF HELL” (.pdf book by Dr. Max D. Younce). I assure you my friend, whoever you may be, that there are NO ATHEISTS IN HELL. Not a one! Jesus plainly said in John 14:1-2 that He said what He meant, and meant what He said. Jesus said, “if it were not so, I would have told you” (John 14:2b). Thus, the Lord would have been deceiving us if the story of the rich man being tormented in Hell in Luke 16:19-31 were not true. Lazarus was a poor beggar, who ate from the rich man's garbage each day. Lazarus believed the Gospel of the Lord Jesus Christ. That is, he believed that Jesus is the Christ Who died upon the cross for his sins, and that He was buried, and that He was resurrected from the dead three days later (1st Corinthians 15:1-4). This is the Good News of the Gospel. You are a woeful sinner, and so am I, and so is everyone else. We all deserve to be punished in Hell for our sins and evil. The Bible says that ALL HAVE SINNED (Romans 3:23). There are NONE RIGHTEOUS (Romans 3:10). Unless you receive Christ's payment on the cross for your sins, you will spend eternity in the fires of the Lake of Fire (Greek: Gehenna). The rich man lived the good life, enjoying his amassed wealth, laying up for his old age. Then one unsuspecting night he died in his sleep, and awoke to the horrifying reality of Hell. The moral of the story is very clear, there is a correlation between earthly riches and one's likelihood of getting saved. Many people have only come to Christ after learning that they are dying of cancer, or have lost everything in life. Rich people very seldom want anything to do with Jesus Christ or His Word. Although Angelina Jolie has never professed publicly to be an atheist, a person is effectively an atheist if they reject Jesus Christ as almighty God (John 1:1-3,14; John 10:33; 1st Timothy 3:16; Revelation 1:8 — Note: All quotes from trustworthy King James Bible). Clint Eastwood, Angelina Jolie and many other Hollywood actors are becoming Buddhists at an alarming rate. In fact, 600,000 American Jews are now Buddhists! You can join any false religion and still be accepted in Hollyweird, but Christianity is banned. Hollywood will accept an immoral professed Christian, like Charlie Sheen, who boasts publicly of his 5,000 fornications. Hollywood can damn the Christian. They'll Damn the holy name of God. They can damn the man. But they'll never damn Islam. They'll never damn the woman. They'll never damn Buddhism. They always damn God's AUTHORITY!!! Angelina Jolie does not identify herself with any single religion, nor has she declared herself an atheist (contrary to the claims of some atheist websites). The subject of religion has not often come up in her interviews, so her beliefs about such things as God and the afterlife are not well documented. Hmm... For some people. I hope so, for them. For the people who believe in it, I hope so. There doesn't need to be a God for me. There's something in people that's spiritual, that's godlike. I don't feel like doing things just because people say things, but I also don't really know if it's better to just not believe in anything, either. So at least in 2000, Angelina Jolie had no specific religious beliefs, didn't personally feel the need for a God and disliked authority-based religion, but was not willing to go so far as atheism and expressed hope that there might be a God for the sake of those who dedicate their lives to religious belief. Angelina Jolie regards Buddhism as an important part of her son's Cambodian heritage and considers him a Buddhist. She has said, "We spend a lot of time [at our house in Cambodia]. And I’m learning about Buddhism and I’m teaching him what I can. He spent a lot of time in temples with monks and he's learning." Shortly after adopting Maddox, Angelina tattooed a prayer for protection for him on her upper back in Khmer script (left). She said, "I asked for it to be done in Buddhist Sanskrit, which is part of (Maddox's) history." "I have a Buddhist son and I'd like a Christian and a Muslim child, too." Aside from any particular religion, Angelina Jolie has given a great deal of thought to the meaning of life, something she has been searching for with great intensity since childhood, as well as considerations of morality. As you just read, Angelina Jolie says she wants to have one child that is a Christian, and another that is a Muslim, and another who is a Buddhist. This is the epitome of the New Age Movement, a homogenous, one-size-fits-all, false religion. Remember, Satan is the author of confusion, not God (1st Corinthians 14:33). Miss Jolie may be sincere in her woeful ignorance of the truth, but the fact of the matter is that she is not a Biblical Christian in any sense of the term, nor does she claim to be. To say that you'd like to have multiple children that all believe different religions is to say that you have no personal beliefs of your own, nor do you care about your children's spiritual welfare. Literally, Angelina Jolie is saying that she would like to have one child who believes Jesus is the Messiah Who died on the cross for our sins; but then she also wants another child who rejects Jesus as the Messiah, denying that Jesus ever died on a cross for anyone's sins. Islam denies the Son of God! The Koran says Allah has no son! Clearly, Christianity and Islam are incompatible! They are day and night apart. Clearly, Jolie has no respect nor faith in the Lord Jesus Christ. She wants one child to honour Jesus Christ, and the other to totally dishonour Him! What a confused woman! Notice to the right in the photo that Angelina Jolie is flashing the popular El Diablo (Spanish for devil) hand sign, which according to Church of Satan founder Anton LaVey is a symbol of allegiance between occultists and satanists. It's obvious to me that Angelina Jolie has sold her soul to the Devil for worldly fame and fortune. You know, there's not much faith in Hollywood these days, and there never has been since that slime bucket got started in the early 20th century. What a cesspool of iniquity! The Bible teaches in 2nd Corinthians 4:4 that Satan is the god of this evil world, and that his goal is to “BLIND THE MINDS” of unbelievers (non-Christians). Satan will do whatever it takes to fool you out of eternal life. Former governor Jesse Ventura publicly said that his religion is that of atheist George Carlin. Well, unless he repents of his unbelief, Ventura will be in Hell with Carlin, and they will both be believers when it's too late! Please don't let Satan take you to Hell. There's no reason for you to go to Hell. I'm telling you the truth in this article, right here and right now. Here's HOW TO BE SAVED. I scream and cry in agony, and shed evaporating tears. You'd think my body would burn up, I've been here so many years! There is no end in sight, we just keep adding to the crowd. He, and others, lied to me, baptism is not accepted. This is where I ended up because the Savior I rejected. Like the joke I used to tell to every listening ear. The Devil is not the King of Hell. I'm told he'll be here, too. The all powerful God is in control and has his end in view. Sadly, some here knew the Bible; but did not comprehend it's worth. They didn't believe Christ died for them while they were still on earth. It's dark, there's excruciating pain, and shadows moving in the flame. I pass the time and gnaw my tongue until they call my name. I've been told it will get worse after the Great White Throne. It all depends on what's in the books. I'm lost! I'll stand alone. I remember how I ridiculed them, and failed the truth to see. They told me Jesus died for me; if I only had believed. My sins would all have been forgiven, and Eternal life received. The pain, the flames, and memory, are my most miserable fate. Hell is a real place, after all; and I have believed too late! From "The Biblical Examination of Hell, available at www.heritagebbc.com, to purchase; or read pdf online. "I've probably read 95% of the words in the Bible. Probably 60% of the Torah. 70% of the Koran. And the thing that is so amazing to me is how everybody, in essence, believes the same thing. I just can't understand how we get from such similar beliefs to murdering one another. My beliefs are that individuals have to create relationships with God. You can't listen to what the preacher says-you have to read the Bible yourself and make your interpretation. I'm good friends with Tom Cruise and I just think a lot of the ideas in Scientology are brilliant and revolutionary and non-religious." Notice that Will Smith thinks Muslims and Christians essentially believe the same thing. What an ignorant thing for Will Smith to say. The Muslim Koran teaches that Jesus DIDN'T die on the cross; but Christianity (the Bible) says Jesus DID die on the cross for our sins. Islam (Koran) teaches that God has NO son; but Christianity teaches that Jesus is the only begotten Son of God. Will Smith needs to do a lot more homework before making such shallow and inaccurate public statements concerning religion and faith. By the way, Scientology is straight out of the pits of Hell! Ron Hubbard continued the satanic teachings of Aleister Crowley under the guise of Scientology. Hollywood actors and famous singers are all COWARDS!!! That is the truth. Kindly, Will Smith needs to get saved. Jesus said if you deny Him before men, so will He also deny you in Heaven. Matthew 10:33, “But whosoever shall deny me before men, him will I also deny before my Father which is in heaven.” It would absolutely break my heart if I thought that my precious Savior in Heaven denied knowing me, because I denied knowing Him. JESUS IS MY SAVIOR, MY GOD AND MY LORD!!! Actress/singer Whitney Houston died at age 48, sadly drowning into her own bathtub under the influence of alcohol and prescription drugs (a deadly mix). She lived a reckless lifestyle of sin. Albeit, I rejoiced to find out that Miss Houston was a professed Christian. Funeral services were held at the Baptist Church where her family attended. Of course, being Baptist doesn't bring eternal life. What convinced me of her sincerity was that I saw a public performance where Miss Houston had a King James Bible in her hand. Of course, carrying a Bible is not the way to be saved either, but it shows some degree of faith in her life. Salvation comes only by receiving Christ's payment on the cross for our sins, and believing that Christ raised up three days later from the dead. I have no doubts that Whitney Houston went to Heaven, having childlike faith in the Lord Jesus Christ (which is the only way to be saved). No amount of wickedness can keep anyone out of Heaven who believes on the Lord Jesus Christ (Acts 16:30-31). In sharp contrast, the late actor Christopher Reeves (who played Superman) died and went to Hell if he adhered to the Unitarian Universalist religion that he joined at age 50. A shocking 18% of the Unitarian Universalist congregation are professing atheists! In this false religion, there are no established dogmas or teachings, so basically it's a church where you can choose to believe ANYTHING YOU WANT! This is not Biblical, nor can it be a New Testament Church, whose foundation is only the Lord Jesus Christ (1st Corinthians 3:11). Make sure that you're building upon Jesus Christ, for He is the ONLY way to Heaven, the only foundation. Michael Jackson most definitely went to Hell if he was true to his corrupt faith. Jackson was a lifelong Jehovah's Witness. They excommunicated him after his Thriller video came out, calling him demonic. That's pretty bad when even a satanic religious cult thinks you're satanic! A couple years before his tragic bizarre death, Jackson's brother converted him over to Islam. Islam doesn't even believe that Jesus died on the cross. Islam is of the Devil. Jehovah's Witnesses deny that Jesus is almighty God. They deny His bodily resurrection. They teach that Michael the archangel became Jesus. How bizarre! By the way, that's what Seventh-Day Adventists teach also. Stay away from these damnable religious cults!!! They will take you to Hell with them! Christianity is not a religious denomination that you join. It is not a business that you profit from. Christianity is not a philosophy that you adopt. When someone claims that they “used to be a Christian,” what they really mean is that they no longer adopt the philosophical beliefs that they once did. My friend, Christianity is a new birth (a second birth, a spiritual birth) which is irreversible. Salvation is a supernatural miracle of God in response to your faith (trust, reliance) in Jesus as YOUR Savior. John 1:12-13, “But as many as received him, to them gave he power to become the sons of God, even to them that believe on his name: Which were born, not of blood, nor of the will of the flesh, nor of the will of man, but of God.” This is what Jesus meant when He said in John 3:5, “YE MUST BE BORN AGAIN.” Once saved, always saved. If saved, always saved. People often ask which religion is the right religion, because there are so many. The answer is found in the Bible, that is, no religion can save you. You are a dirty sinner, and so am I. We all deserve to burn in Hell. The good news of the Gospel is that Jesus paid the debt we owed of sin. If we'll simply accept Christ's payment upon the cross, believing that He bodily raised up from the dead, then we are saved (1st Corinthians 15:1-4). Please don't go to Hell. Religion wants to fit you with glasses, but the Lord wants to open your eyes. I assure you that if you die IN YOUR SINS (John 8:24) instead of IN THE LORD (Revelation 14:13), you WILL BELIEVE there is a God as soon as you arrive in the torments of Hell beneath. It won't be a party! Your friends may be there, but you won't see them! You will be separated from God and loved ones for all eternity! Is this short life of sin, shame and Satan worth your eternal soul? Don't allow these things to hinder you from coming to Jesus Christ to be forgiven and cleansed of your sins by His precious blood (1st Peter 1:18-19; Revelation 1:5)!